I know some folks didn’t like the Kagami and Tsukasa that Wave first released due to their unorthodox appearance for the Hiiragi sisters, but I was rather fond of the figures so I jumped at the chance to own Misao in the same format. For those who don’t remember, Misao is a girl from Kagami’s class 3-C while most of the main characters are in class 3-B (Konata, Tsukasa, Miyuki). As a result, we don’t see as much of Misao but when we do, she’s memorable as the super-energetic girl with a fanged tooth and likes to say “Va!” a lot xD. She was one of my favorite side characters throughout the series so I’m quite glad Wave decided to give her a figure. 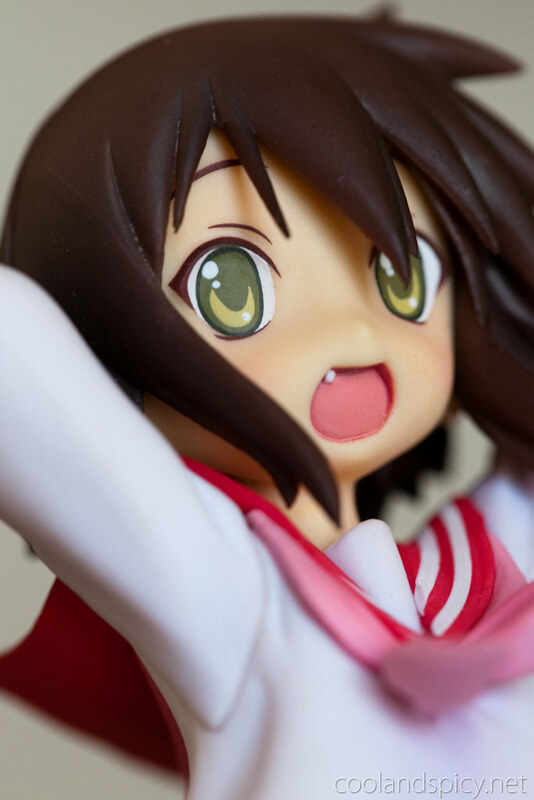 Although I certainly am glad Wave decided to make a Misao figure, it does make me wonder why they chose her over more popular characters such as Konata or Miyuki. 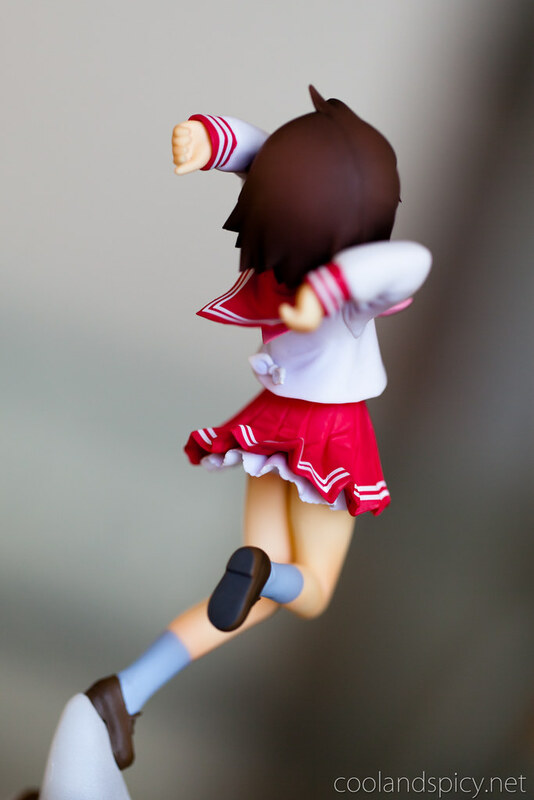 Perhaps they’re not done with the 1/12 scale line of figures? I would definitely welcome more of the Lucky Star girls in this style! 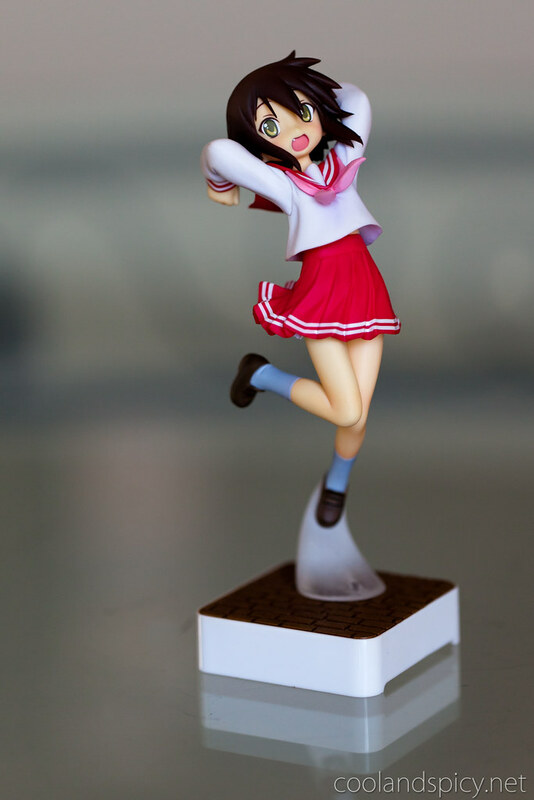 A figure for 32000 Yen? No wonder people are not happy with the price for such size (it’s a typo I know :P)! As I’ve already said, Misao looks great with her paintjob and the dynamic pose,even more when you consider her small size. Yeah, the detail is pretty nice for how small it is. 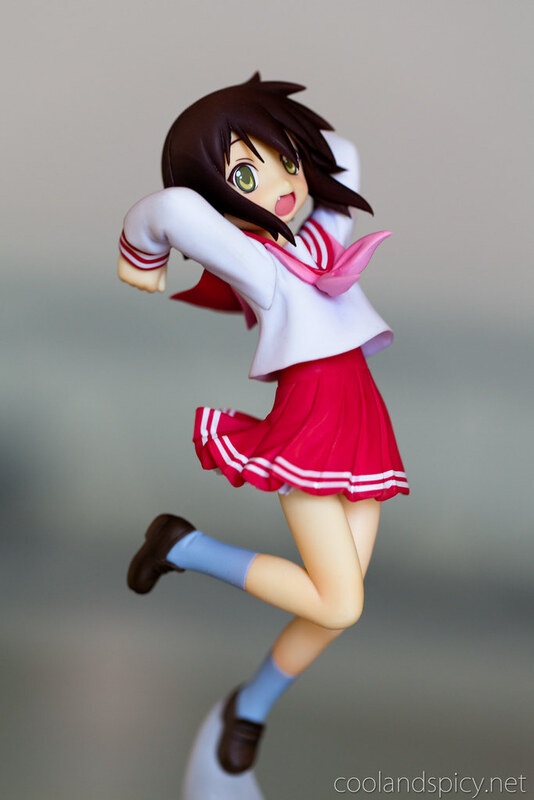 That’s what I liked about the first 2 figures and what assured me that Misao would also be a good buy ^^. 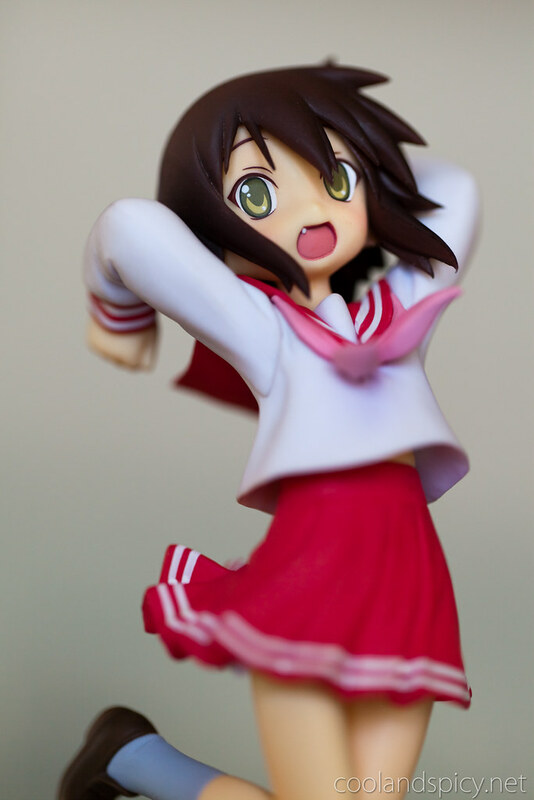 Even though I’m not fond of Wave’s 1/12 line I love Misao as a character. The way she says “yo Hiiragi” and laughs are soooo cute. Plus I have a bit of a fang weakness. Va-Chan! My god! I was hoping for the frezzing one though but this one is cute…. Thanks to her I not stop yelling VA! at work…. maybe I will start a website too…. 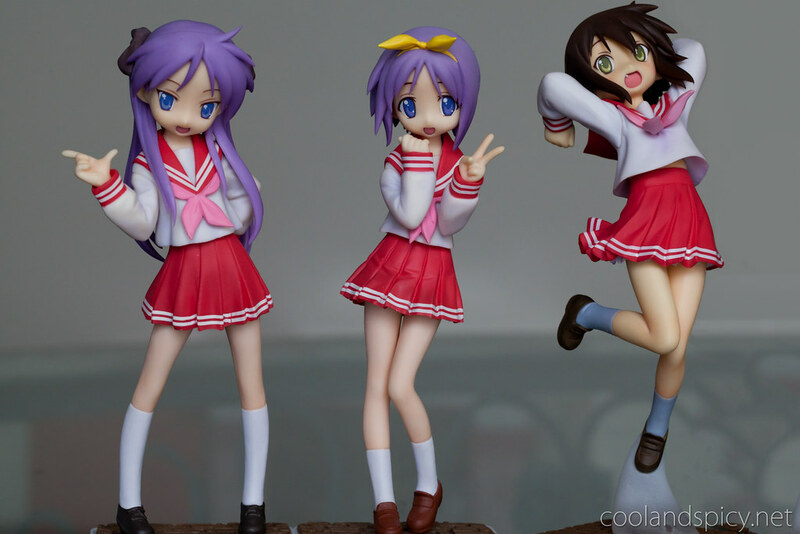 The Lucky Star girls look so cute posing together!